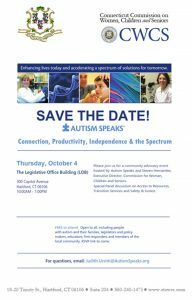 On Thursday, October 4 from 10am – 1pm the annual Autism Speaks community advocacy event will take place at the Legislative Office Building (300 Captiol Ave., Hartford). A panel discussion will include access to resources and transition services. The event is free and open to the public. RSVP information and event details below.